This week’s minorities in cartoons entry is Nubia, a longtime Wonder Woman supporting character. 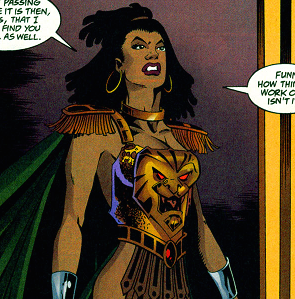 Nubia first appeared in “Wonder Woman” (vol. 1) #204 in January 1973. Robert Kanigher and Don Heck created Nubia. Nubia was an early example of an attempt at introducing diversity into superhero comics. As such, she was introduced with an unusual origin story—by being retroactively inserted into Wonder Woman’s own origin! Nubia’s backstory stated that she too was sculpted from clay like her sister Diana, with both statues brought to life around the same time. However, as a baby, Nubia was kidnapped by the Amazons‘ (and Wonder Woman’s) longtime foe, Mars (known as Ares post-Crisis). Mars raised her as part of a plan to defeat his Amazon foes. Decades later, the two siblings reunited; their mother, Queen Hippolyta, cleared up her long-lost daughter’s backstory. Nubia only made a few other 70s appearances: one in an issue of Supergirl’s comic, and another in the “Super Friends” spin-off comic. A doll of her was also made (oddly billing her as Wonder Woman’s “super-foe”), as a tie-in to the 1970s “Wonder Woman” TV show. However, the show didn’t use her by name as a character. From “Wonder Woman” (vol. 2) #154 (March 2000). Art by John McCrea. After Wonder Woman’s 1987 reboot, Nubia became a more distant relation of the Amazons/Diana. In the revised continuity, Nubia was a previous chosen champion sent from Paradise Island thousands of years earlier for a mission to guard a gateway to the underworld. (Her name was also respelled as “Nu’bia.”) Nubia, however, didn’t appear much post-Crisis either; she only appeared in several issues. Nubia’s powers are the same as Wonder Woman’s—superhuman strength, speed, stamina, etc. The post-Crisis version also had the ability to turn people into stone. She also usually possessed a magical sword of some sort. Modern depictions of Paradise Island/Themyscira depict the Amazons as a racially diverse group. However, Nubia occasionally appears in some depictions as one of various “sisters” of Diana. Said mentions leave out the complex comics backstories described above. One such depiction was in “Scooby-Doo Team-Up” #5 (July 2014), where she met the Scooby-Doo gang!